[EAN: 9789004189256], Neubuch, [PU: BRILL], Brand New, Unread Copy in Perfect Condition. A+ Customer Service! Summary: Summary: Despite the crucial role played by both law and architecture in Roman culture, the Romans never developed a type of building that was specifically and exclusively reserved for the administration of justice: courthouses did not exist in Roman antiquity. The present volume addresses this paradox by investigating the spatial settings of Roman judicial practices from a variety of perspectives. Scholars of law, topography, architecture, political history, and literature concur in putting Roman judicature back into its concrete physical context, exploring how the exercise of law interacted with the environment in which it took place, and how the spaces that arose from this interaction were perceived by the ancients themselves. The result is a fresh view on a key aspect of Roman culture. [EAN: 9789004189256], Neubuch, [PU: Brill], BRAND NEW, Spaces of Justice in the Roman World, Francesco De Angelis, Despite the crucial role played by both law and architecture in ancient Rome, the Romans never developed a type of building that was specifically and exclusively reserved for the administration of justice: courthouses did not exist in Roman antiquity. The present volume addresses this apparent paradox by investigating the spatial settings of Roman judicial practices from a variety of perspectives. Scholars of law, topography, architecture, political history, and literature concur in putting Roman judicature back into its concrete physical context, exploring how the exercise of law interacted with the environment in which it took place, and how the spaces charactarized by this interaction were perceived by the ancients themselves. The result is a fresh view on a key aspect of Roman culture. [EAN: 9789004189256], Neubuch, [PU: BRILL], In the aim to understand the place of law within the landscape of Roman life, this volume explores the interaction between judicial practices and the spaces in which they took place. 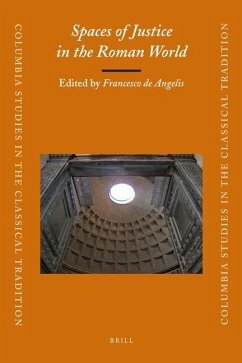 Through an interdisciplinary approach, it offers a new, multifaceted picture of a key aspect of Roman culture.